Displayed in the Storm King museum as part of Indicators: Artists on Climate Change, Underground Library is a long-term project based around a collection of five decades of defunct, passed over, or ignored books on climate change—from unread technical manuals to best sellers. 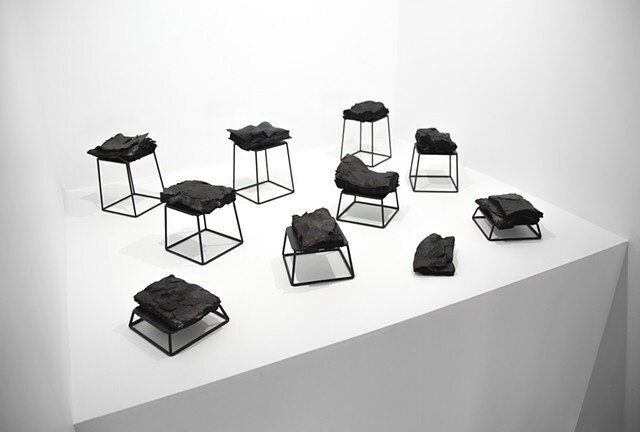 Collected by the artist from thrift stores, free-book boxes, and used-book stores, Jenny Kendler processed these forgotten texts through biocharring, which uses a low-oxygen pyrolization, or burning, process to sequester carbon and thus keep it from entering the earth’s atmosphere, normally a consequence of decaying organic matter. When buried in the ground, biocharred items provide a number of benefits for plants, grasses, and soil-friendly bacteria by reducing soil acidity and feeding microbial life underground. Underground Library exists simultaneously as the physical objects seen here, as a series of documentary photographs, and as installations of the books buried in the landscape—creating a literal underground library.